This calculator will calculate your ideal weight based on your height, weight, and body-frame type, plus calculate how many pounds or kilograms you need to gain or lose to achieve it. The results also include a bar chart comparing your ideal weight with your current weight. Select your preferred measurement type. To estimate your frame size, wrap your thumb and index finger around the opposing wrist. If your thumb and finger overlap, you have a small frame. If your thumb and finger barely touch, you have a medium frame. If your thumb and forefinger don't touch, you have a large frame. This is the estimate of ideal amount you should weigh. No single calculator is capable of determining your exact "ideal," as none can account for your unique fat proportion, bone density, or muscle mass. However, just having an estimated target is better than having no goal at all. As long as you don't go below the safe level of calories per day (1,000-1,200 for women, 1,300-1,500 for men), common sense and a mirror will tell you when you've reached your own unique HW. This is the weight you would need to lose/gain in order to achieve your estimated ideal weight. This calculator will help you to calculate the ideal amount you should weigh based on your gender, height, and body-frame type. Plus, it will also tell you how many pounds or kilograms you will need to lose or gain in order to achieve that ideal. The calculations used in this calculator are based on the Hamwi Method, a formula developed by Dr. G.J. Hamwi. What sets this formula apart from other similar formulas (Robinson Formula, Miller Formula, etc.) is that the Hamwi Method accounts for differences in body frames (small, medium, and large). Note that this formula is usually only recommended for adults who are at least 5 feet tall. Enter your height in inches or centimeters. If you are working with Standard measurements and need to convert feet and inches to inches, expanding the description will reveal a mini calculator for quickly converting feet-inches to inches. 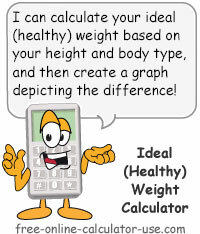 Click the "Calculate Ideal Weight" button. This will generate your calculated ideal weight, the amount you are over or under by, and a bar chart comparing your ideal weight to your current weight. Medium Frame: 100 pounds for first 5 feet of height, plus 5 pounds for each inch over 5 feet. Add 10% for a large frame and deduct 10% of a small frame. Medium Frame: 106 pounds for first 5 feet of height, plus 6 pounds for each inch over 5 feet. Add 10% for a large frame and deduct 10% of a small frame.